From Les Avants train station, take the funicular to Sonloup. Here, turn left and follow "Le Cubly". You will soon see an esplanade with a breathtaking view over Lake Geneva. Walk half an hour on a crest, through the forest. Near a wooden hut, a promontory offers an incredible viewpoint over Lake Geneva, the mountains and vineyards. This is the "Cubly" summit. Look around to discover the ruins of the old «Salaussex » watchtower. From here, walk down the stairs and turn left on a small path. Then follow the road to Les Avants. Follow the signs decorated with narcissus. 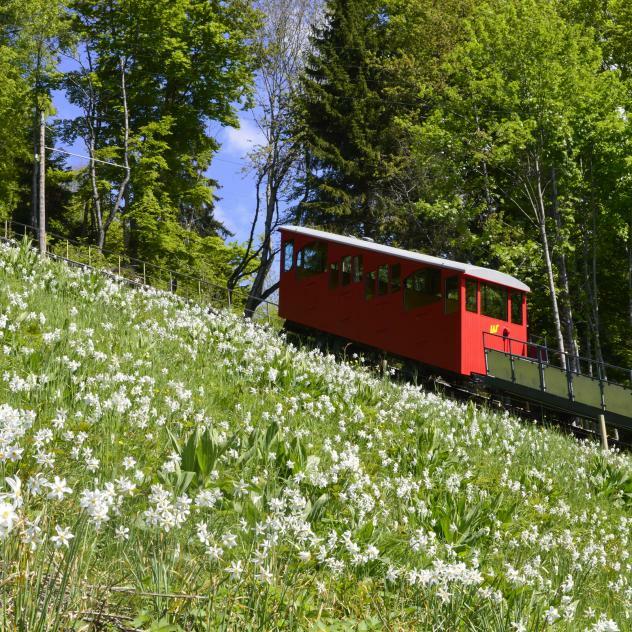 Built in 1910 and recently renovated, the Les Avants – Sonloup funicular has the special feature of having kept its carriages and machinery from the good old times. A curiosity that is worth seeing.